This will be the last post on the short life of this blog. As friends and colleagues know, I have been on a glide path out of the climate field for a while now, mainly because I have had my say and as a scholar I am ready to move on to more fertile fields of study. This is a decision that I made long before the events of the past week. I had thought I’d just quietly fade away on the issue, but after the events of the past week, that obviously isn’t happening! So to be clear: I am no longer conducting research or academic writing related to climate, I am not available for talks, and on the climate issue I have no interest in speaking with reporters or giving testimony before Congress. This is not a problem for me or the issue. The field is rich and full of smart people doing interesting work, and the topic will for a long time remain scientifically important and politically significant. I’ve been privileged as a scholar to have been able to participate in the debate, along with great colleagues with whom I’ve collaborated and learned from, and to have our views been heard at the highest levels of both science and policy. As a policy scholar I could not ask for any more. Commentary – I have written commentary on various aspects of the climate debate in the New York Times, Wall Street Journal, Financial Times, USA Today and many other places. These too can be found at my University of Colorado website. Going forward, if I have anything further to discuss or report about the Congressional investigation of my work, it’ll be over at Roger Pielke, Jr.’s Blog where I will of course continue to write about science, innovation and politics. I do keep getting encouraged to do a 2nd edition of The Honest Broker, so perhaps that is still in the cards. If I do feel compelled to comment on climate issues, not likely, but if so, it will be on Twitter @RogerPielkeJr. For the past few years the bulk of my academic attention has been focused on issues related to the governance of sport (as my Twitter followers know). I will continue to be blogging on that subject at The Least Thing, which is also the title of a book that I am completing this spring. People argue a lot about sports issues too. We policy scholars tend to gravitate to such issues. Thanks for reading! We’ll be watching at your other blog. Good luck! Roger–Thank you for your contributions to climate science. You and your father are some of the very few people who I trust as honest brokers in this area. Your departure is a huge loss, but completely understandable. Despite all that has been written about what science is or isn’t, I think that science is best described as a metaphor…that of a young child looking through a magnifying glass at a bug. Your perspective has helped me get back on the correct side of that magnifying glass. Thanks again and best of luck. Fair enough. It’s definitely understandable. However, it means that the people who drew up the list of 7 will now consider they have done a good job. They have removed someone who pointed out when they misled the public. They know that they will have made climate studies an area where only those who go with the party line are accepted. Hi Roger, I think it’s a shame that you’re closing the door on climate-related research, but I also think I understand your reasons. I’ve always enjoyed our conversations and hope our paths will continue to cross. If not to talk about climate policy then at least to argue with you about football. Thanks for some fantastic contributions to adaptation and disaster research, and for always resisting dogma; we wouldn’t be where we’re now without your work. Take care! Who are these other currently publishing climate scientists that share similar views to your own in the arena of climate and energy policy? Do they have a blog that can be followed for information/analysis apart from what can trickle down through peer review? Wanted to make sure Roger saw Jonathan Koomey’s response to his accusations of COI. Thanks for your contributions, Roger. I and several of my friends and fellow young scientists, all of whom are quite concerned about the risks posed by climate change, read your blog and your books and had many discussions over the past few years about your work and I think we all consider your ideas to have been highly valuable, particularly in understanding the role of science and scientists in policy debates. You are a victim of the climate obsessed witch hunt against heretics. The loss of the voices of your father as well as you is significant and are lost for the same reason. If we are very, very fortunate and an autopsy of what went wrong with climate policy is conducted in the reasonable future, I hope you will participate. Thanks for your patience Roger with those that not only disagree with you, but do so with poor grace. An undeniably true and humbling statement from 2001 – and there is little to improve on it since. Something real as Michael Ghil suggests? 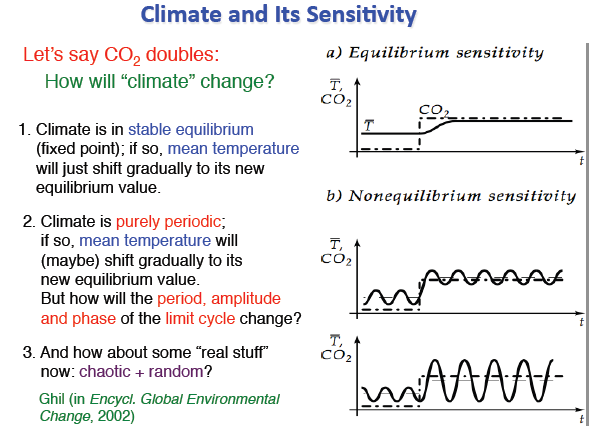 This schematic shows abrupt changes in climate means and variance. Small changes in control variables drive the system past a threshold at which stage the components start to interact chaotically in multiple and changing negative and positive feedbacks – as tremendous energies cascade through powerful subsystems. Climate shifts happen every 2 to 3 decades – caused by shifts in the balance between powerful internal mechanisms – and the extent and even direction of shifts is unknowable beforehand. In this light shed by complexity science – it is difficult to see how climate science can usefully increase climate certainty – other than by affirming utter uncertainty. On the other hand – changing control variables that involve population and development, land use and conservation and multiple gases and aerosols may drive the system towards thresholds. The solutions are – however – far broader than dismantling democracy and overturning capitalism.